It’s early morning. Children rush to school everywhere. Your Canadian students are likely walking along sidewalks through their subdivision, or waiting to climb aboard a yellow school bus. Perhaps parents’ vehicles clog the side streets near your school. Your students will be engaged in learning activities throughout the day, and probably have after school sport or art opportunities. 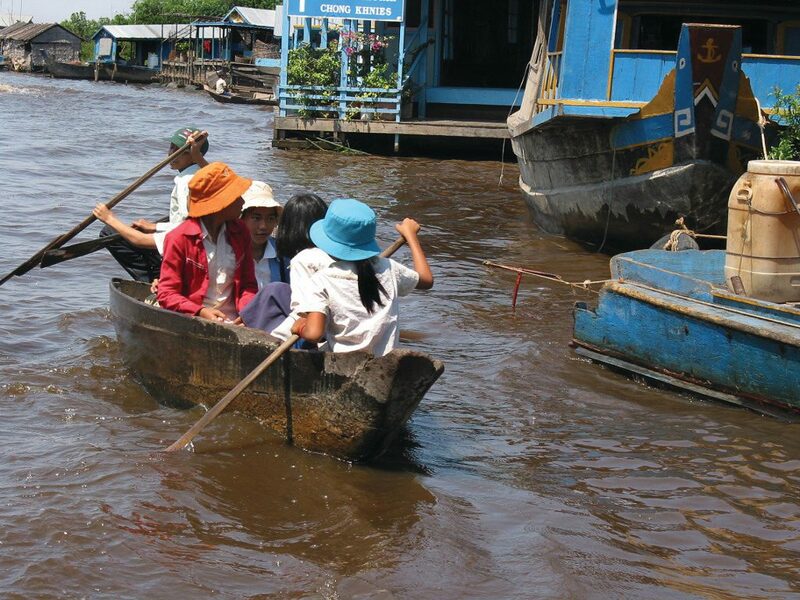 Paddling to school in Cambodia. Zoom around the world to Tonlé Sap, the largest freshwater lake in Southeast Asia. Here wooden houses float on the lake. Even the school itself is built on pontoons and floats up and down with the fluctuating water level. Children who have something that will float and in which they can paddle to school are the lucky ones. They will get to learn. Some manage to come to school in a washtub, using a large wooden spoon as a paddle. In Sikkim, in the Himalayas, children live too far away from the small school to walk back and forth each day along the narrow mountain paths. So the school has a sleep loft where students stay overnight. This also relieves parents of the burden of having to feed their children. Dutch and Canadian teachers who run this school have taught their students to grow a garden. They cook and do dishes together. Ruairidh also attends a boarding school but his is quite different. Merchiston Castle School in Edinburgh, Scotland was founded in a medieval castle. Ruairidh and his classmates learn and live at school, only going home for the holidays. But in Shedd, Oregon, Jessica and Victoria experience the opposite. They never leave home: they are being homeschooled. Their classroom is just off the kitchen. Their teacher is their mother. School days never really stop and include science, Latin, math, vocabulary. “But at least we never get sent to the principal’s office!” says Jessica, who loves to look after her 4H chickens and turkeys during a school day. During my travels to conduct author visits to international schools, I see a wide variety of education offered to children. I have visited state of the art international schools across Asia, but also a school in the rain forest with nothing but a dirt floor and some wooden benches. No books, no computers. I wanted to show children how different a school, or a day in school, can be for others around the world. My book My School in the Rain Forest, How Children Attend School Around the World is a photo collage of thirteen different countries and schools. It includes a virtual school in Egypt, a school under a tree in Kenya and the School of the Air in the heart of Australia. Some of these schools are well off. Others can use some help to achieve “quality education.” If your school is looking for a service learning project, you might want to adopt one of these schools. The school in the Himalayas owned six books when I first contacted them. The teacher told me, “The books are kept in a locked case. We can’t afford to let the children use them in case we lose these books. They are too rare.” They only brought the books out to read them aloud, allowing one child to carefully turn a page. 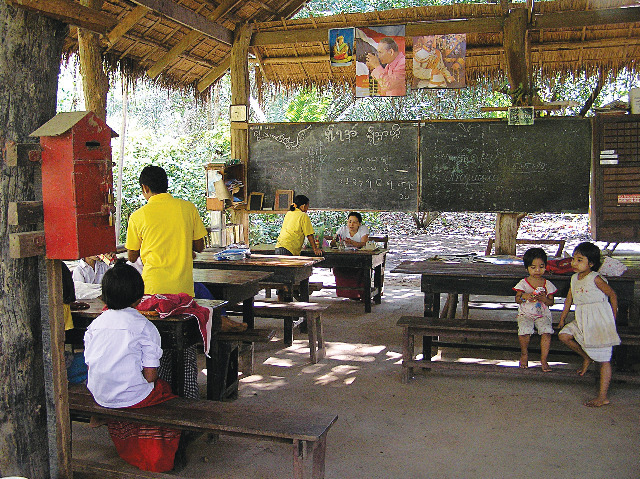 A school in the rain forest of Thailand. My local reading council collected quality picture books. We bought pencils and paper when they were on sale at the office supply store. With the financial help of a local Rotary group, we mailed several boxes of books and school supplies. Now the children can read, borrow and use the books! It is amazing what an impact you and your students can have. If you don’t want to collect, pack and mail books, look into supporting the International Book Bank (www.internationalbookbank.org), Books For Africa (www.booksforafrica.org) or Greg Mortenson’s project, Pennies for Peace (www.penniesforpeace.org). Or support UNICEF by funding a school-in-a-box which will be sent out to disaster areas in times of emergency (www.unicef.org/supply/kits_flash/schoolinabox/). Margriet Ruurs is the author of 28 books for children. She conducts author visits to schools around the world and lives on Salt Spring Island, BC, Canada.